If you’re the type of person who checks their Instagram feed multiple times throughout the day, then Feeday is for you. Feeday is an iOS widget that gives you an instant overview of the latest posts without having to open the app. It’s free for iPhone and iPad and an Apple Watch version is being developed as well. On iPhone and iPad, it sits in the notification center and gives you the option of a grid of three, six or nine tiles. The catch is that you’ll need to stump up for a $0.99 in-app purchase to opt for the six or nine title option. While the concept is simple, it has some nice features. 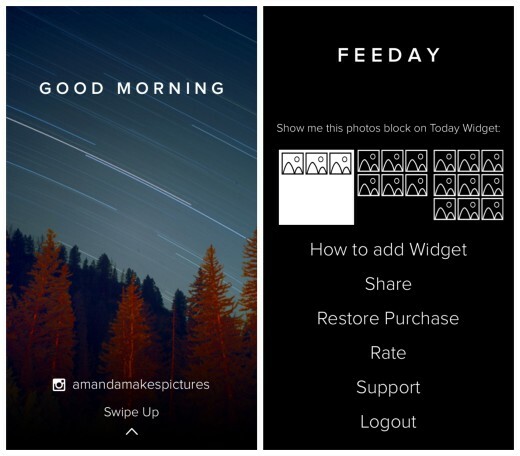 The images on the widget are constantly updated and you can open them directly in the Instagram app with one tap. The widget’s accompanying app is more a control center than anything else. It has a nicely designed greeting screen when you open it and by swiping up, you get access to display settings, support, login/logout and the option to rate it. The notification center is something that, before now, I only ever used for continuously checking the weather and having a quick glance at updates. I’d never customized it prior to downloading Feeday. I am pleasantly surprised by how much I like it. Admittedly, I’m a prime candidate – someone who browses Instagram a lot more than Twitter or Facebook – but occasional users will enjoy it as well. That said, I’d like to see the creators add a way to customize the feed to include specific people or hashtags. Feeday is convenient and helpful, and if nothing else, makes notification center look a lot sleeker.